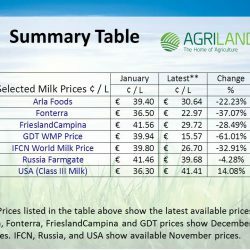 Major international dairy co-operatives, Arla, FrieslandCampina and Fonterra announced milk price reductions in December. Arla’s price fell 1.9 cents to 30.64 cents per litre, and FrieslandCampina posted a drop of 3.62c/L to 29.72c/L. 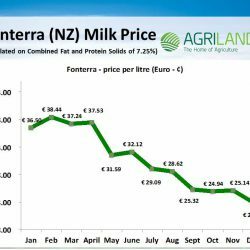 In the southern hemisphere Fonterra’s 2014 / 2015 season pay-out price was back a further 2.17 cents in December, settling on a price equivalent close to twenty-three cents per litre. 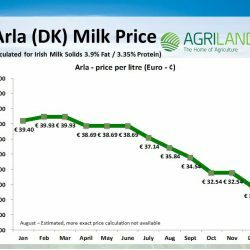 Arla – Arla, Denmark started the year with a milk price close to 39.40c/L, and finished in December at 30.64 cents, a 22% drop over the course of the year. It is also interesting to note that Arla increased the Protein:Fat price per kilogram ratio from 1.2:1 in January, to 1.3:1 in February and have held in there since. Arla, like Fonterra adjust the weighting of the constituent prices periodically to reflect market returns. 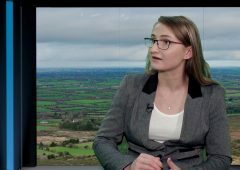 Such progressive steps are not reflected in Irish milk pricing systems, with many Irish co-ops holding the same ratios since their initial introduction of the A + B – C price system. 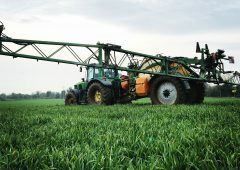 Fonterra – Kiwi dairy farmers have seen some of the biggest price drops globally over the year. 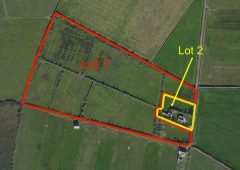 The 2013 / 2014 season pay-out settled at NZ$7.50 per kgMS with an added dividend 32 cents per share, resulting in a cash pay-out of NZ$7.82. 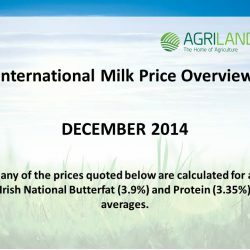 For equivalent Irish milk constituents this amounts to €35.97c/L. Currently, Fonterra’s Forecast Milk Price for the 2014 / 2015 milk season (ending May 31st 2015) is forecast at NZ$5.05 per KgMS, including share dividend. This is equivalent to €22.97c/L. 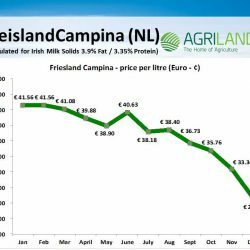 FrieslandCampina – Dutch based FrieslandCampina started the year with a Farmgate price of 41.56c/L. 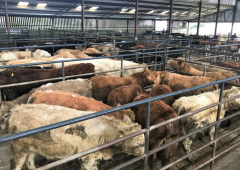 The December price settled on 29.72c/L, a 28% drop over the year. FrieslandCampina also introduced a new pricing mechanism in January 2014. They moved away from the A + B – C pricing to a new A + B + Lactose pricing mechanism. 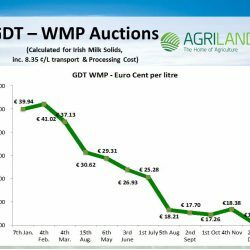 GDT WMP Price – GDT Whole Milk Powder Auction prices were in freefall throughout 2014, peaking at US$5,005 per tonne in February, a price equivalent of over 41 cents per litre. The final WMP auction of the year settled at US$2,270 per tonne, equivalent to less than 16c/L. 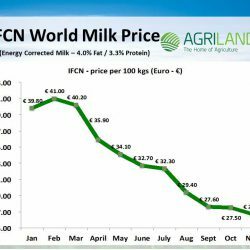 IFCN World Milk Price – The IFCN world milk price has followed international trends over the course of the year. 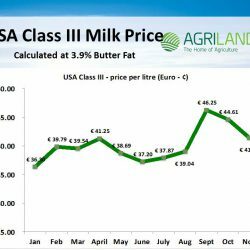 Starting in January with a price of €39.80 per 100kgs for energy corrected milk. 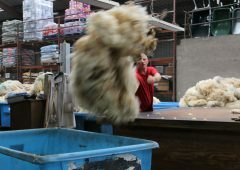 November’s price stands at €26.70, a fall of almost 33%. 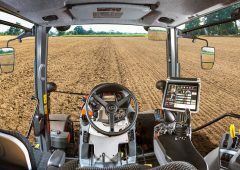 USA Class III – USA dairy farmers are having a good year, supply is up, feed prices are down, and dairy product exports increasing. Class III Milk price has increased, starting at 36.30 €/cents per litre in January, and reaching a peak of 46.25 cents in September. Prices have softened in recent months. 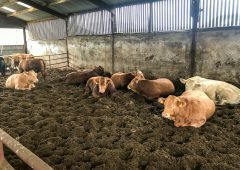 The November price currently stands at 41.41c/L. 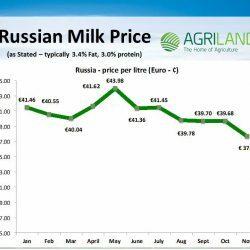 Russia Farmgate – Earlier this year, with high hopes for export growth in the Russian market, Agriland start tracking Russian Farmgate Milk price. 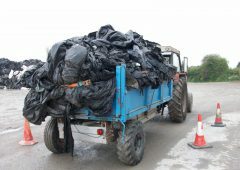 The EU dairy import ban instigated by Russia in August put paid to such Irish dairy export ambition. 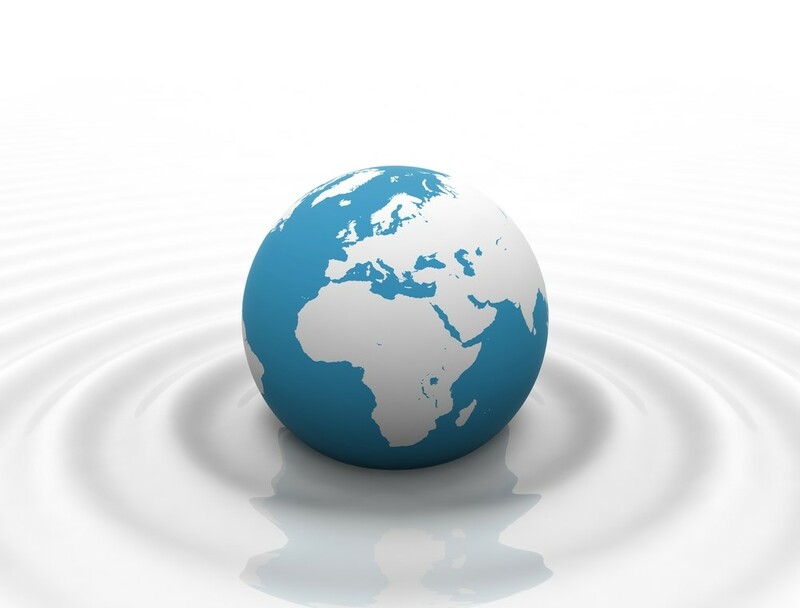 Even if the ban is lifted in 2015, will Russia have the purchasing power to return to previous import volumes? 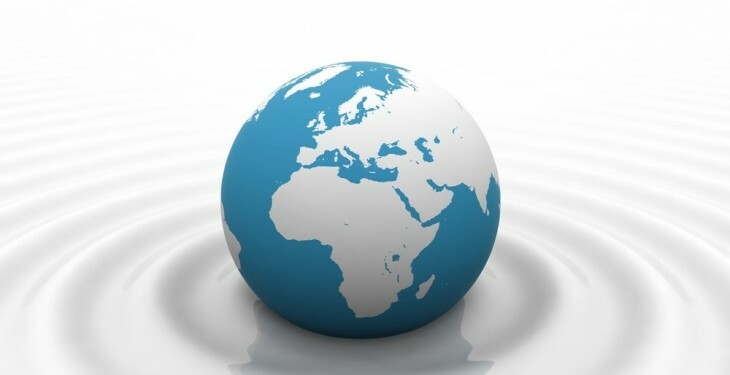 Falling oil prices are taking their toll on the economy, and the value of the Russian Rouble to the dollar dropped to half of its August value earlier this week, thereby pushing up the price of imports in Roubles dramatically.